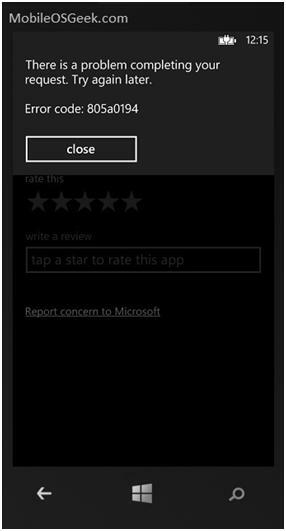 The MarketplaceReviewTask launcher is used to launch the Windows Phone Store and display the review page of the current windows phone app . How to use the MarketplaceReviewTask Launcher in Windows Phone 8 using Oxygene ? To use the MarketplaceReviewTask Launcher in Windows Phone 8 with Oxygene, follow the below steps. 2. Create an instance of the MarketplaceReviewTask and invoke the Show method of the MarketplaceReviewTask object . Just run the application by hitting the F5 shortcut key . Note that When launching the MarketplaceReviewTask from the app in the Windows Phone Emulator , You will receive an error.